National Geographic’s new documentary "Sunken Treasures of the Nile" will feature Photosynth technology, the team blog reports. 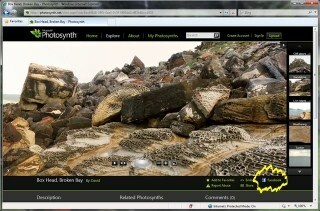 Initially, Photosynth was being used to recover the point clouds and camera poses for creating 3D models, but later, the team at xRez Studio, which used photogrammetric techniques to document the artifacts, found that they were able to create models and test the theories that Egyptologist Philippe Martinez, the director Frédéric Wilner, and Kevin Cain from Insight Digital came up with during the day. After photographing the sites during the day’s filming, the crew was able to test theories later that night. This allowed Photosynth to not only play a role in the post for the film, but ended up allowing it to be used in the film directly. Nice! The documentary began airing August 3rd. To find the showtimes for the film in your area, search your set-top box or DVR guide for the title and then set it to record.